But Carmelito has not given up his right to land. He, together with 170 other agrarian reform beneficiaries from Mindanao, held a campout in Manila. MANILA, Philippines – It’s been more than 20 years but Carmelito Mendoza still remembers the terror he, his family, and neighbors had been subjected to by the private security personnel hired by the agribusiness firm Tagum Agricultural Development Company, Inc. (TADECO) to evict them from their land in Tagum City, Davao del Norte in Mindanao, more than 1,400 kilometers south of the Philippine capital Manila. “Nakakatakot. Hindi kami makatulog sa gabi (We were terrified. We could not sleep at night),” Carmelito told PAN Asia Pacific (PANAP), recalling how armed men would roam around their community, especially at night, to deliberately prevent them from getting any peaceful sleep. His family had no choice but to leave the place he grew up in, and the farm he, his father, and his siblings worked hard on. Now 57, he works as a tricycle driver 20 kilometers away in Panabo City where he, his wife, four children, and grandchild live. TADECO, on the other hand, has now become a top grower and exporter of bananas in the world, supplying Japan, China, Hong Kong, Malaysia, the Middle East, Russia, Singapore, and South Korea with the Cavendish variety under the global brand Del Monte. “Malakas ang TADECO (TADECO is powerful),” he quipped, talking not only about the company’s deployment of heavily armed guards around its facility and plantations, but also its political connections, which is why agrarian reform beneficiaries (ARBs) under the government’s Comprehensive Agrarian Reform Program (CARP) such as himself have been evicted from and cannot even set foot on his farmland. But Carmelito has not given up his right to land. He, together with 170 other ARBs from the Southern Mindanao Region and Northern Mindanao Region, arrived in Manila on October 15, and held a campout in front of the national offices of the Department of Agrarian Reform (DAR), to demand that the government agency immediately issue installation orders to force the companies to give them back their lands. They were part of thousands of farmers from various regions around the Philippines who gathered in the national capital as part of the “Pambansang Lakbayan ng mga Magsasaka para sa Lupa at Laban sa Pasismo” (National Farmers’ Caravan for Land and against Fascism) from October 16 to 25. This year marks the 29th year of implementation of CARP, which is supposed to promote social justice and to move the nation toward sound rural development and industrialization, through the equitable redistribution of public and private agricultural lands to landless farmers and farmworkers. For a period of 10 years – from 1988 to 1998 – DAR was expected to redistribute 7.8 million hectares of land. The program, however, failed to meet its target and needed to be extended several times, the most recent of which was under the CARP Extension with Reforms (CARPER) in 2008. By the time the current President Rodrigo Duterte assumed office in July 2016, 6.9 million hectares or 88% of the target agricultural lands have been distributed after almost three decades of implementation. Aside from the slow process of land distribution under CARP, a number of factors prevent ARBs from fully exercising their right to land. For one, Certificate of Land Ownership Awards (CLOAs) are getting cancelled because of loopholes in the Comprehensive Agrarian Reform Law (CARL), the legal basis for CARP, according to the national alliance of farmers, Kilusang Magbubukid ng Pilipinas (Peasant Movement of the Philippines or KMP). DAR, meanwhile, found that only 25% of the 906,997 ARBs were able to complete their payments on land awarded to them. Friends Haide Maike, 54 and Hermanita Ordinario, 67, of Madaum, Tagum City also came to Manila to demand the same from DAR – i.e. the issuance of an installation order for the 724 members of the Hijo Employees Agrarian Reform Beneficiaries Cooperative (HEARBCO) awarded under CARP with 579 hectares of land currently occupied by Lapanday Foods Corp. (LFC), another top producer and exporter of Cavendish bananas, pineapples, and other fresh produce in Asian countries. HEARBCO’s land is part of the 1,324 hectares of land voluntarily given away by the Hijo Plantation Inc. (HPI) to its workers, and granted CLOAs by DAR in 1996. LFC, to which HPI transferred its management rights in 1997, however, contests HEARBCO’s claim to land, citing an ongoing management contract between them, which HEARBCO members consider as unfair. The DAR, under the leadership of former Secretary and peasant leader Rafael Mariano, already granted an installation order in May this year for a separate 145 hectares of land also under LFC’s management, in this case, for the 159 members of the Madaum Agrarian Reform Beneficiaries Association Inc. (MARBAI). LFC, however, did not acknowledge the order, as MARBAI was originally part of HEARBCO (but broke away in 2011) and thus is under the similar contract with the banana export company. “Hanggang lumabas ang installation order (Until DAR issues the installation order),” Haide, who has been to Manila for the third time now as a participant of Lakbayan, said when asked until when she and her fellow HEARBCO farmers are going to keep the campout at DAR. Both Haide and Hermanita were not natives of Madaum but relocated when their respective husbands got employed by HPI in the 1970s. Since the death of their husbands, the friends took over the fight for their land for their children and grandchildren. In the Bicol Region, around 400 kilometers south of Manila, ARBs are under the threat of expulsion from their agricultural lands by several public and private development projects, according to Norberto Autor, Chairperson of KMP’s chapter in the Bicol region. In the province of Masbate, for instance, agricultural lands in Bantolinao and Napayawan in the municipality of Aroroy are eyed for an ecotourism project. Reportedly a joint venture project by former senator Ferdinand Marcos, Jr. and Macau gambling tycoon Stanley Ho, the project will result in the loss of farmers’ and fishers’ homes and livelihood. Likewise, farmers are under threat of eviction with the planned expansion of the Naga Airport located in the province of Camarines Sur. The project, when implemented, will affect 135 hectares of highly productive land, including 20 hectares allocated for palay production for the entire region. The slow and tediously long process of securing titles to land and basic flaws of the agrarian reform program are only some of the many problems faced by farmers in the Philippines. While fighting for their land, farmers are subjected to different forms of repression, some allegedly state-sponsored, to intimidate them into silence. During the past administrations, human rights advocates and peasant groups claim that farmers were among the top targets of the counter-insurgency programs, which aim, among others, to secure vast tracts of agricultural land for both domestic and foreign development projects and investments. 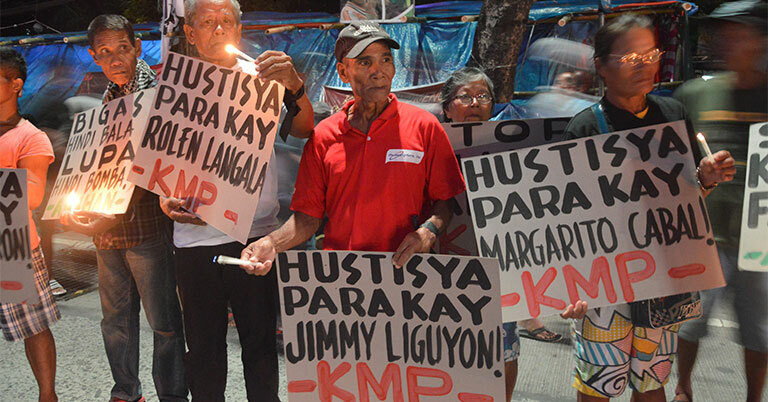 A candle lighting activity organized by Filipino farmers and land rights advocates on October 20 sought justice for the 91 farmers killed under the Duterte administration. In terms of number of farmers killed extrajudicially, the controversial incumbent Pres. Duterte is on his way to surpassing the record of the previous two administrations of Gloria Macapagal-Arroyo (603 for the period of January 20, 2011-June 30, 2010) and Benigno Aquino III (270 for the period of June 30, 2010-June 30, 2016). According to the human rights group Karapatan, 91 farmers or 6 per month, have already been killed since July 2016. Aside from the killings, harassment, threats and intimidation, enforced disappearances, illegal arrests, and the filing of fabricated charges are common tactics against farmers and land rights activists. In the Bicol Region, for instance, 24 farmers have been killed, while 34 have been slapped with trumped up charges. The militarization of current and potential development areas in various parts of the country has also resulted in the displacement of countless farmers and indigenous peoples. In the Southern Mindanao Region, the relentless bombing of peasant and Lumad communities in Matalam, North Cotabato; Laak, Monkayo, and Pantukan, Compostela Valley; Maquilala, North Cotabato; and Digos, Davao del Sur have repeatedly driven away thousands of families away from their homes over the past year. #NoLandNoLife Features discuss recent developments, events, and trends on land and resource grabbing and related human rights issues in the region as well as the factors and forces that drive it. Send us your feedback at nolandnolife@panap.net.